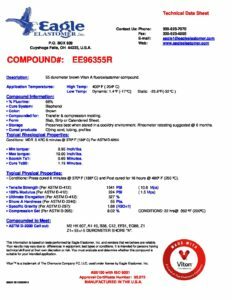 Viton Fluoroelastomer Compound EE96355R - Eagle Elastomer Inc.
 Min torque: 0.95 Inch/lbs.  Max torque: 10.00 Inch/lbs.  Scorch Ts1: 0.69 Minutes.  Cure Tc90: 1.19 Minutes.  Shore A Hardness (Per ASTM D-2240): 55 Pts.